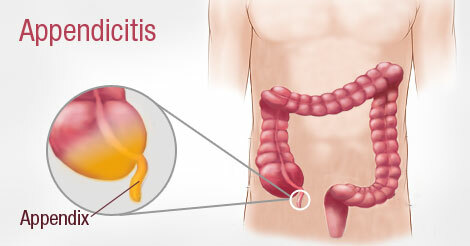 Appendicitis is an infection of a small section of the bowel called the appendix. It is a pouch at the junction of the small and large intestines. The size of the small finger, it is lined with a mucous membrane that produces a clear secretion. This organ has no known function. One theory, though, is that it plays a role in the immune system very early in life. Partly digested food and liquids traveling through the bowel pass in and out of the pouch when it is open. If this flow is blocked, bacteria trapped in the appendix may multiply. This is thought to cause appendicitis. Appendicitis occurs when bowel contents that flow into the appendix are blocked and cannot flow out. Normal intestinal bacteria get trapped and multiply, causing swelling and infection. The blockage may be due to very thick bowel contents or another obstruction. While cancer of the appendix is very rare, the block is occasionally due to a benign tumor called a carcinoid. Surgery to remove the appendix is called an appendectomy. Some people need antibiotics too, to help avoid or cure infection. A ruptured appendix may require more extensive surgery. As many as one in five people with this condition end up with a second abdominal abscess (collection of pus).